As we age, the phrase “Your lucky if you end up having one good friend in life” starts to reveal itself as a fact. One must ask themselves if they prefer to be isolated or socially integrated? This simple question has a simple answer: Everyone feels better about themselves when they are socially integrated, connecting with others. Those who are vulnerable are those who are aged 65 and older, facing retirement, limited physical activity, who may have lost a spouse or loved one. 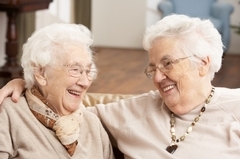 The most vulnerable group are females aged 75 or older who live isolated. Regardless of age group isolated adults report poorer health than their counterparts who are socially integrated. In fact, it has been found that the memory of mice has improved when co-housing them together vs solitary living. Mice are social beings just like people when it comes to benefiting from the gift of relationships. In conclusion, people have a higher risk of developing dementia, poorer health, and poorer outcomes if they are lonely and live isolated. However, these risks are minimized for people who co-house with others, strengthening their relationships daily.